Brand new in from Zero Sixty Thicker design more stopping power for longer. These brake discs meet and exceed the original equipment manufacturers specifications. The new zero sixty performance brake discs feature a unique dimpled and grooved pattern - both for better image and for better performance. The dimples eliminate the thermal cracking that can be found in drilled discs.All these features allow the heat to dissipate as quickly as possible to eliminate brake fade. The Pumaspeed Workshop team are ready to fit the Zero Sixty 260mm Ultra Performance Grooved Discs in our Head Office located here. Therefore making parts and labour a total cost £254.40 (inc. VAT). 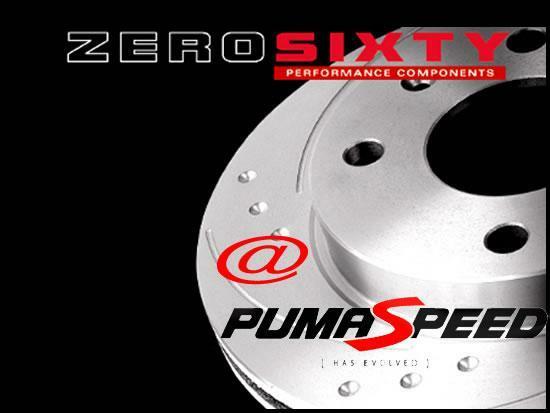 Pumaspeed have a specialist distribution team that can dispatch the Zero Sixty 260mm Ultra Performance Grooved Discs to any destination worldwide.